Laura DePrado, right, accepts a 2016 Horticultural Therapy Week proclamation from then-Freeholder Director Pat Walsh. The Somerset County Board of Chosen Freeholders congratulates horticultural therapist Laura DePrado of Branchburg on her recent article in the American Horticultural Therapy Association’s Journal of Therapeutic Horticulture. “Raising Awareness of Horticultural Therapy with the Seed of ‘National Horticultural Therapy Week’ and Roots of New Jersey Agriculture” appears in the journal’s fall issue. 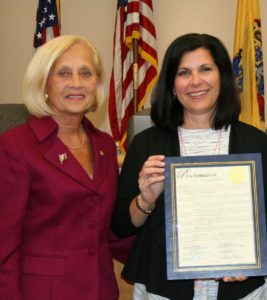 The article recounts her successful efforts, with the help of state Sen. Kip Bateman and former Assemblywoman Donna Simon, to make New Jersey the first state in the nation to celebrate Horticultural Therapy Week during the third week in March, starting in 2016. Gov. Chris Christie signed the joint legislative resolution into law in May 2015. The New Jersey Senate and Assembly resolutions, along with proclamations from Rep. Leonard Lance and from the Board of Freeholders, were presented at a freeholders’ meeting in February 2017. DePrado offers numerous programs for children through seniors, including a very successful horticultural therapy program for adults with developmental disabilities at SCLSNJ’s Warren Township Library branch. “Laura’s innovative program not only gives participants a hands-on project to complete, it also fosters cooperation and friendships among adults who face numerous challenges,” said Freeholder Deputy Director Patrick Scaglione, library commission liaison. Horticultural therapy is the time-proven practice of utilizing the therapeutic benefits of working in a peaceful garden environment and using horticulture to improve quality of life. It successfully empowers individuals to achieve their maximum independence, providing people of all ages in rehabilitative, health care and residential settings, and has the indirect benefit of encouraging the creation of public and community gardens. DePrado holds a bachelor of science degree from the University of Northern Texas and a horticultural therapy certificate from Rutgers University. 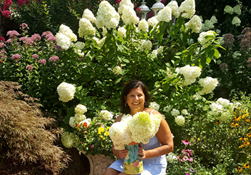 She is a registered horticultural therapist with the American Horticultural Therapy Association and president of Final Touch Plantscaping, LLC, in Branchburg. She recently was nominated by Leading Women Entrepreneurs in Business & Enterprise, and received the 2017 Chairman’s Award from the New Jersey Agriculture and Natural Resources Committee. She is an appointed member of the Somerset County Board of Agriculture and writes a horticultural therapy column for Gannett media outlets.